Some time ago I wrote a piece about the St Matthew of the Lindisfarne Gospels, which was painted by one Brother Eadrith in the 8th century. At the time, I was unsure as to who the figure peeping from behind the curtain might be. There is a physical likeness between the two figures, so it might be so. Fr Sebastian Carnazzo, who teaches a course on scripture and icons for the Masters in Sacred Arts at Pontifex University, suggested to me that this might arise from St Augustine’s that Matthew was the first to write a Gospel. The Gospel of Mark was written using Matthew as a source, and the Gospel of Luke was written using Mark as a source. This is something which might well have been known by Eadfrith, and so he portraying Matthew as the ultimate source. The color of the gospel book itself, turquoise, matches too. The question then arise: Why didn’t he show also Mark as being derived from Matthew? Here is Eadfrith’s St Mark; he is depicted according to the traditions as a young, dark-haired man. 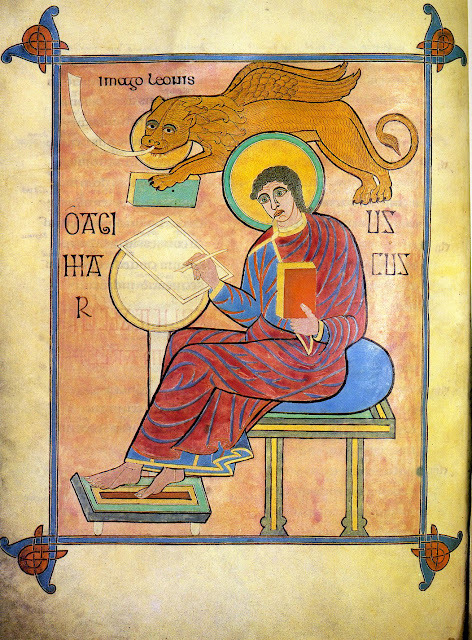 The Lion which represents him is clutching a Matthew-colored, i.e. turquoise gospel. So perhaps this might be a sign of the source. However, as an artist, I know that Eadfrith is as likely to have chosen his color scheme based upon what he thought looked good and the availability of pigments as any other criterion, so one has to careful not to over-interpret. 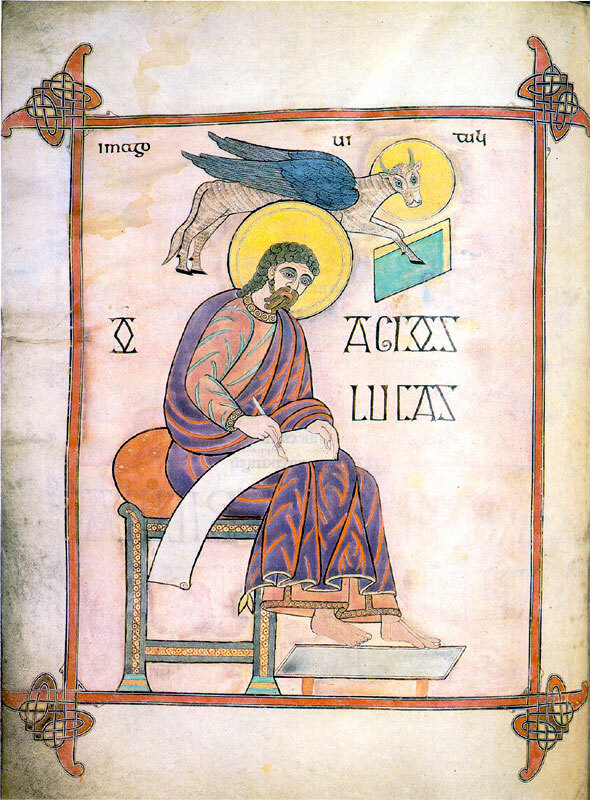 Fr Carnazzo also referred me to Michelle Brown’s book “The Lindisfarne Gospels: Society, Spirituality and the Scribe,” which suggests that there was also tradition of depicting with each Gospel writer the source of his inspiration; for Matthew this is Christ, for John the Holy Spirit, while Mark is informed by Peter and Luke is connected to Paul. 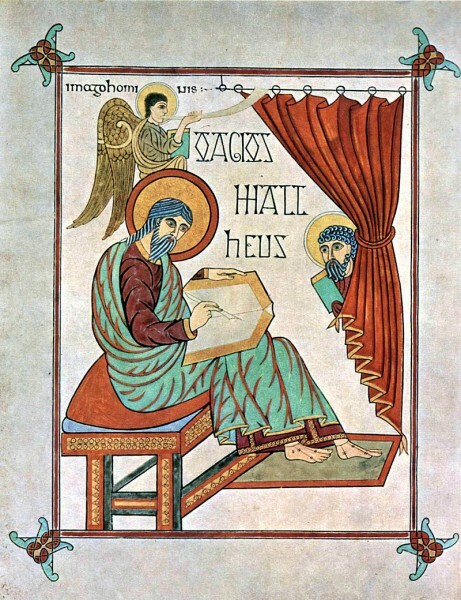 However, this seems to me to be less relevant as for the peeping figure with St Matthew, who, it seems to me, is listening to him, not dictating.